While a few mobile devices have sported an internal projector in the past, I’ve actually never used one. So I was intrigued when a review tablet with a DLP projector arrived at my home office. The SmartDevices U7, a budget 7-inch Android(s goog) slate packs a pair of Texas Instruments(s txn) components. TI’s OMAP processor powers the tablet while the company’s DLP chips are used for the projection feature. It’s difficult to capture on video what the output looks like, so bear that in mind: What may look bad to you on camera actually looks better in real life. Overall, I’m impressed by the projection system, but as you’ll see, you really need dim to dark conditions for optimal viewing. If you have those, however, it works really well. I’ve already enjoyed a movie on the ceiling of my bedroom, for example, simply to get a large screen experience. It’s great to view pictures on a large “screen” as well. The DLP chip itself is really small, though: Check the video for a look at TI’s actual DLP mirrors and how little thickness the projector adds to a device. Texas Instruments isn’t the only player in this space, however: Intel is working hard on a similar solution for phones and tablets. 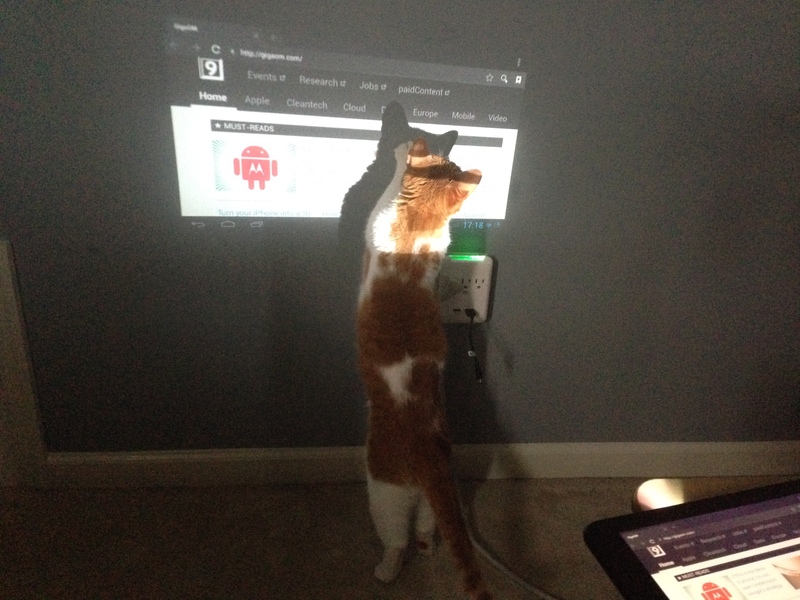 After shooting the video, I may have stumbled on to the best use yet for projectors integrated in mobile devices: Pet distractors! A very good piece if kit! – Just got mine and tested it, video is very good! But all in all i think its a FAB product!